Bobby Jindal's absurd budget: The Louisiana governor finds a way to pretend he didn't raise taxes. 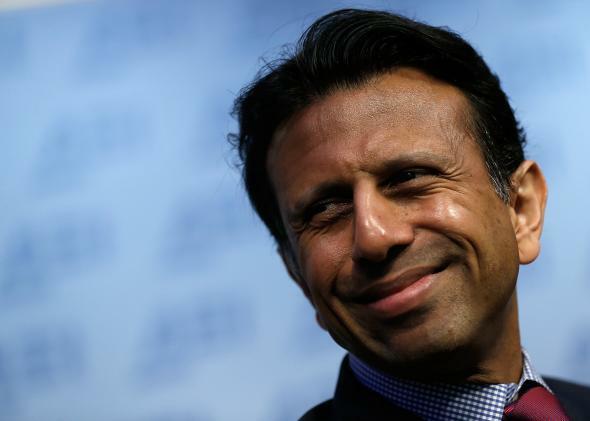 Bobby Jindal, looking proud of himself. While Kansas has become a strictly tragic cautionary tale about what happens when a politician actually tries to govern in line with radical conservative tax dogma, Louisiana is turning into more of a dark comedy. Coming into this year, the state was facing a $1.6 billion budget shortfall. Unfortunately, Gov. Bobby Jindal—America’s spirit of hopeless presidential ambition incarnate—had signed Grover Norquist’s pledge not to raise any taxes. This left lawmakers in a bit of a bind, since cutting their way to fiscal health would have meant decimating public health or higher education funding. Last week, however, legislators ultimately passed a budget that raised hundreds of millions of dollars in new revenue, sparing hospitals and colleges. Better yet, Jindal says he’ll sign it. So, how’d they square this circle? With a mind-numbing budget gimmick, of course. Here’s how the Advocate describes what’s become known as the “SAVE” program. It would assess a fee of about $1,500 per higher education student and raise about $350 million total, but only on paper. Students wouldn’t have to pay anything because an offsetting tax credit for the $1,500. Nor would universities receive any new money. However, the SAVE fund would create a tax credit for the $350 million that Jindal could use to offset $350 million of the new revenue that legislators are proposing to raise. So, to repeat, Jindal created a fake fee for students, and a fake tax credit to balance it out, which ultimately leads to no money changing hands, but apparently satisfies whatever agreement Jindal struck with Norquist to preserve the illusion that he didn’t raise taxes. “It’s an embarrassing bill to vote for,” one Republican state representative told the New York Times, demonstrating the sort of candor that only becomes possible once your own party’s governor has alienated the vast majority of his state and abandoned all pretense of rational policymaking in pursuit of an inevitable also-ran performance in the GOP primary. Anyway, because the budget bill relies on a number of short-term fixes, Louisiana could end up in another hole soon enough. At some point, that joke won’t be funny anymore.